Dhaka South City Corporation Job Circular 2019 has published in January 2019 with a few posts of different categories. The application will run up to 14th February 2019. The more details about this job circular has given below. Dhaka South City Corporation Job Circular 2018 has announced by the Dhaka south city corporation authority with an outsourcing system job and office assistant, computer operators etc. The application deadline 22nd August 2017. The Job seekers will be decided after directly going at the south city corporation office with their CV and requirements presentation. There is no exam system are available to decide the selectors. Educational Qualification: At least JSC Passed applicants and SSC Passed applicants can apply for all positions. 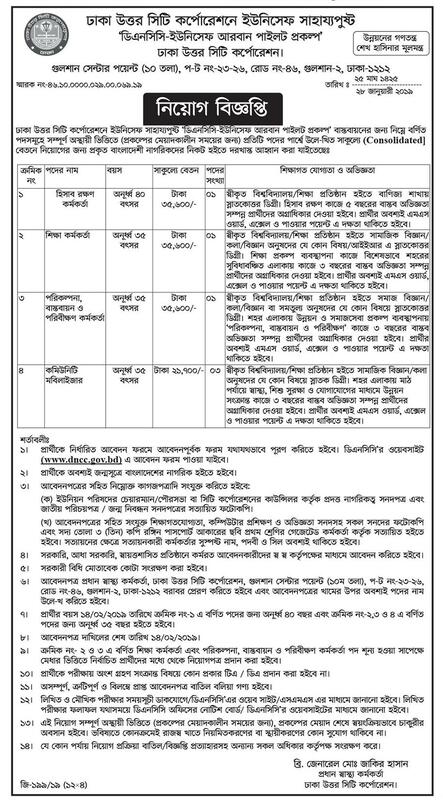 Dhaka city corporation has announced a new job circular for the north city of Dhaka. The application will be taken up to 14th Feb 2019. To apply applicants need to get the application form from the website of www.dncc.gov.bd. Here is the circular. Visit here www.dncc.gov.bd to download Application Form. Salary: Daily work based payment. To get regular such government job circular stay with our page and share our post to your timeline. You can also comment on our Facebook page at www.facebook.com/Bdresultpage or message to our Facebook page directly to contact us. Thanks for being with us. To get more information about the Dhaka South City Corporation Job Circular 2019 contact with us on our Facebook page or comment below for further information.